Strong Allergy Relief--Reduce energy and sleep-robbing airborne dust, dander, smoke and pollen up to 99 percent. Strong Odor Control--Quickly trade odors, smoke smell and stale air for fresh, healthy air. Reduces odors and VOCs (including mycotoxins from mold) up to 99 percent. Strong Air and Surface Disinfection--Greatly reduces mold, viruses, and bacteria in the air and on surfaces up to 99 percent. Stop the flu virus this season! Compact, Lightweight and Easily Portable. Great for Travel! *Coverage is extended beyond CADR calculated 450 square feet due to AHPCO and other ion technologies reaching and purifying approximately twice as much space compared to similar air puirfiers without ions. **30 Day Money Back Guarantee--30 days from date of purchase, no restocking fees. Customer pays return shipping to Air Oasis. Today’s air purifier market is flooded with misinformation, with companies working hard to gain a competitive edge by stretching the truth. One claims HEPA filtration or carbon absorption is the best option. Another says filterless molecular ionization is the right choice. It’s confusing. The Air Oasis iAdaptAir M provides the top five technologies in one smart, app-enabled, indoor air quality monitoring, self-adapting air purifier for unmatched air quality in it's price range. Scientifically Tested and Doctor Recommended: Industry experts acknowledge our products help people breathe easier and feel better. Third-party lab tested to reduce up to 99.99 percent of H1N1 Influenza virus, bacteria, mold, mycotoxins, and VOCs in 20 minutes or less. Recommended for use by physicians across the United States to reduce allergy causing pollutants and for patients suffering from the effects of chronic hypersensitivities to mold, chemicals and mycotoxins. Proprietary Bi-Polar Ionization - The Air Oasis iAdaptAir M provides all the benefits of negative ionizers in a small compact package without the negative effects. Bi-Polar ionization splits humidity, already present in your air, into positive hydrogen ions and negative oxygen ions without the production of ozone. These ions then go beyond the boundaries of filtration to seek out and destroy pollutants such as mold, bacteria, viruses and VOCs on a molecular level. Mobile App and Smart Control Panel: You can monitor and control iAdaptAir M with the built-in control panel, or remotely, with an easy-to-use app. This allows for the remote control of multiple iAdaptAir® purifiers in multiple locations from anywhere in the world, including a scheduler, fan speed, child lock/night mode, auto-off timer and more. It even monitors and displays the current air quality around the iAdaptAir M, so you can make changes as needed, remotely. Intelligently Designed For Maximum Protection Without All The Noise: By utilizing up to four small ultra-quiet fans, the iAdaptAir M efficiently pulls air evenly across the entire surface of the filter cartridge and through all five layers of our advanced air purification technologies. The unique array of fans maintain whisper-quiet noise levels from 25dB to 52dB, resulting in an air purifier so quiet you will hardly notice it. Using multiple types of ions, the iAdaptAir S is able to cover larger spaces up to 900 square feet with a lower fan speed and fewer air changes per hour--that means better air quality improvement with less noise and less energy usage. Smart. Order your Air Oasis iAdaptAir M Small Room Air Purifier here at a discount online sales price and see for yourself what fresh, clean air really feels like! 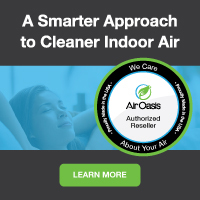 There are not many official online retailers of Air Oasis air quality products and unfortunately the internet is full of scams. As a general rule of thumb, if the deal seems too good to be true, it probably is. Cheap cut rate online deals often end up being a used or refurbished unit, which do not come with Air Oasis's top rated warranties. Or even worse, you may end up buying a cheap discount air cleaner that doesn’t have the energy efficiency, features or real air cleaning power provided by top-rated Air Oasis air filtration systems. When you buy your money and energy saving Air Oasis air filtration products from us, you get a brand new unit, at the best possible price, with Air Oasis's top-rated 5 year warranty. Our innovative partnership with Air Oasis allows us to ship directly from their warehouse, which cuts out the middle man and eliminates the high operating costs of traditional brick and mortar big box stores. These savings get passed directly to you, allowing us to offer brand new allergy and asthma symptom-eliminating Air Oasis air purifiers and filters at the best possible everyday cheap discount online sales prices. And buying from us is definitely better than direct. If you buy direct, you'll have to pay shipping. Buying from us, however, you always get fast free ground shipping as our thanks to you for shopping with us.